But within a few years, the bailiffs came in and it was Simon's son Abraham, who stepped in to save the company. 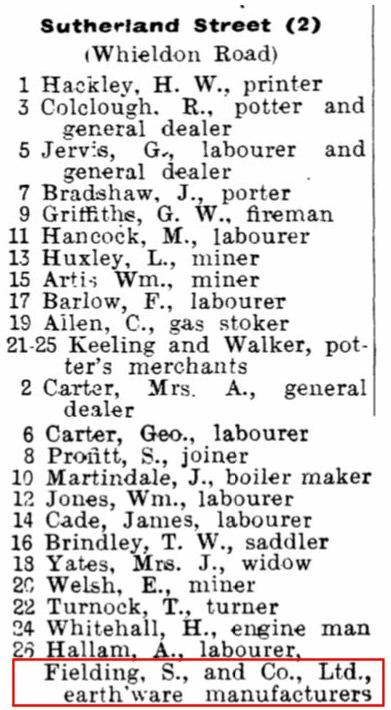 In June 1892 Simon Fielding retired from the businees and Abraham continued on his own account. In 1912 the Railway Works was renamed The Devon Pottery and Fielding developed the famous 'Crown Devon' name. 1893 trade journal article on S Fielding. FIELDING, Abraham (1854/5-1932), pottery manufacturer, Stoke upon Trent. Abraham Fielding was born in Middleton, Lancashire, the 'son of Simon Fielding (died 1906), an authority on dogs and poultry, who came to Trentham to work for the Duke of Sutherland. Abraham Fielding was educated at St. Peter's School, Stoke upon Trent, and at Thomas Hemming's school in Copeland Street, where, in 1870, he passed the Cambridge Local Examination. He served an apprenticeship as a colour maker at Blythe Colour Works, Cresswell, later becoming a partner in this firm. Their productions included majolica argenta. 1955 article on Blythe Colour Works. 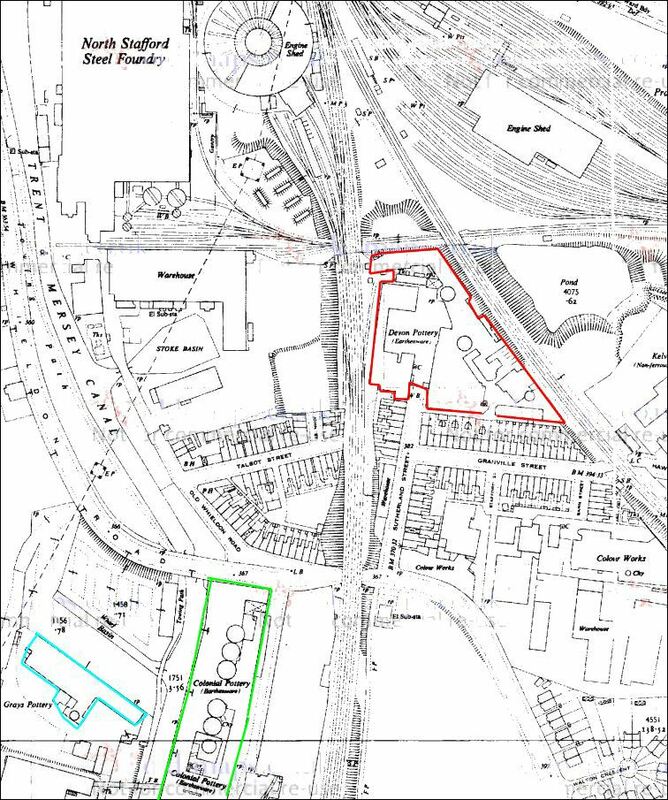 Abraham Fielding's father (Simon) lent money to three potters to set up in business at the Railway Pottery, Sutherland Street. The business ran into financial difficulties and Abraham Fielding took it over in 1878, and expanded its operations. Abraham Fielding became president of the Ceramic Society, and was a freemason. As a young man he had been an athlete, cyclist, swimmer and footballer and served as secretary of the Victoria Cycling Club, often travelling from his home in Cresswell to work on a penny- farthing bicycle. He was president of the North Staffordshire Harriers, and for some years was chairman of Stoke Football Club. He continued to ride to hounds, often three times a week, until an advanced age. His only son, Alec Ross Fielding, played football professionally for Stoke Football Club, Nottingham Forest and West Bromwich Albion. One anecdote told of him concerns West Bromwich club officials who came to the house to sign him up. They were received by the butler who informed them that Master Ross was out riding to hounds. Abraham Fielding died on 23 March 1932 at Mill House, Blurton. Sources: Information from D. J Benning; Jewitt. 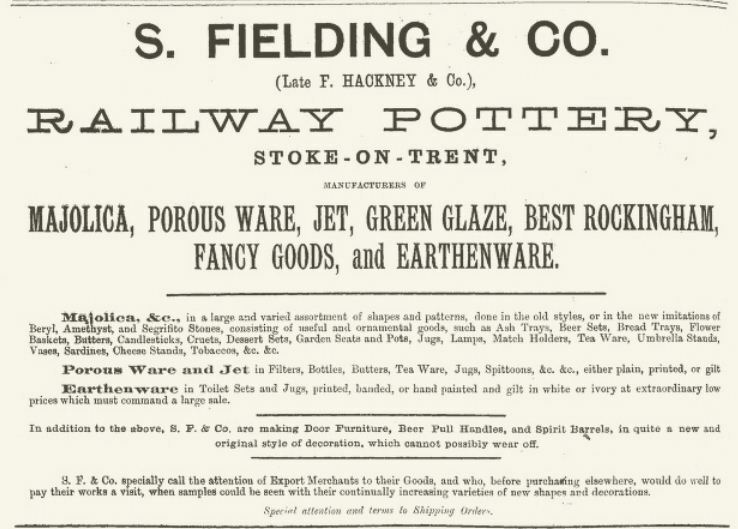 Railway Pottery Established by S. Fielding & Co. in Sutherland Street in 1870 for the manufacture of majolica, terra-cotta, jet, Rockingham, green- glaze goods and general earthenware, in all of which the usual useful, ornamental, and fancy articles were made. This firm introduced in the early 1880s a new feature in majolica goods, which they named 'Majolica argenta', in which they produced a vast variety of articles of a remarkably taking, pleasing and useful character. This, as its name implied, consisted of a white body and glaze with the proper majolica colouring liberally and judiciously used either on the body or on the embossed decorations. The effect was extremely pleasing. Some of the more popular and artistic patterns were 'Shell and Net', 'Ribbon and Leaf', 'Daisy', and 'Fan'; and in each of these, the idea of the pattern was fully carried out on an infinite variety of articles, ranging from large ice-dishes and bread-trays to cups and saucers and al1 the minutiae of the table. 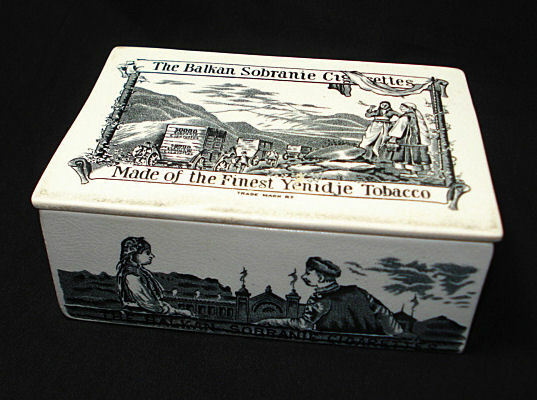 One of the distinctive features of the majolica produced by Messrs. Fielding & Co. was the masterly and effective way in which they introduced, on some of their best pieces, hand- modelled flowers and foliage. Modelled and coloured true to nature in every minute detail, and thrown in graceful negligence around the bodies of the vases, they became such perfect reproductions that it was difficult to divest the mind of the idea that the roses were not fresh gathered from the tree and temporarily twined around the vase for its adornment. 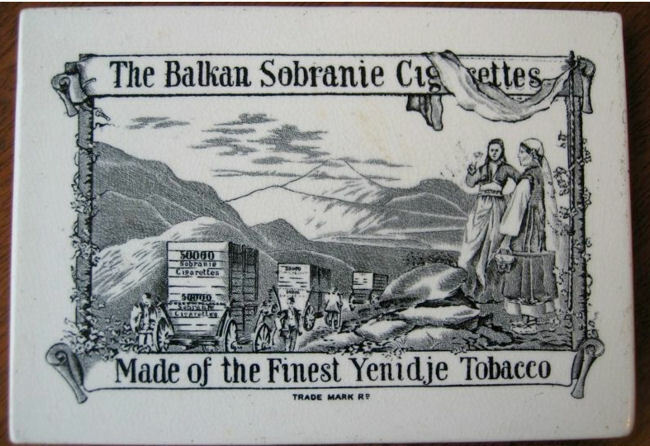 In addition to majolica, which had been their staple trade, Messrs. Fielding & Co. extended their works, in about 1880, by adding the manufacture of a good quality of earthenware, in which they produced all the usual services and other articles. Among the novelties in toilet-sets were the 'Spring' and 'Fruit' patterns, the under- glaze decoration of which was of a highly satisfactory character; and another in which the handle of the ewer was formed of a riding-whip, the thong of which was brought round the sides, which were further decorated by a horseshoe in relief suspended from a ribbon. 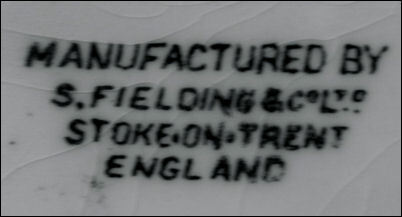 Their mark was FIELDING impressed, or the name of the pattern on a ribbon with the initials S F & Co printed. Messers S Fielding continue to the present day (actually to 1982). Their well known trade name is Crown Devon. 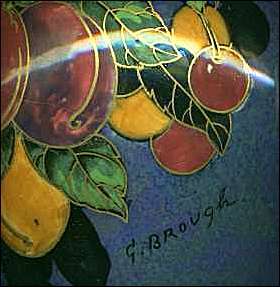 Hand painted vases and other objects were produced in the twentieth century.